Click Here for our Available Rentals. Click Here to for our Rental Application. Are you looking for a Property Manager? 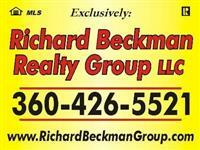 Review The Richard Beckman Realty Group Property Management Services Now! Vacation Rentals - To Search for vacation rentals Click Here. Thank you for selecting Richard Beckman Realty Group to help with your move to the Mason County area in beautiful Washington State. Be sure to check what is available with Washington property for rent or for sale in Olympia, Union, Hood Canal, Hoodsport, Allyn, Belfair, Grapview, Alderbrook, and the surrounding areas. Forbes Says WA is #2 for Rentals! The local economy continues to create new jobs, boosting both rentals and home sales. A rental market downturn back in 2003 has kept a lid on new construction, buoying rental prices. Class A rental prices grew by 6.7%, to $1,169 per month, and Class B/C units rose 7.8%, to $833. If you are curious about the city you are considering your move to, we have put together some serious data about Shelton, Olympia and other local towns. You may be wondering what the city is like. How are the local schools and where do they rank in the national percentile for graduating students? Trying to decide if you should rent or buy? Use our rent calculator. Before you buy or rent property in Mason County WA, be sure to check out the community information, and highlights of events planned for the upcoming year. Find out what your new local government plans for redevelopment and possible future housing communities that are being sought out. get information about local Mason County schools, and track the local events for Shelton as well as other Washington communities. Selling your home in Washington is an important decision. It is important that the sale of your home is handled with care and professionalism. Feel free to further explore this site for Current News in Shelton Washington. Once you feel you have the information you need, and are ready to go forward with plans to relocate to the Washington State area, Contact our Office for detailed information on the local market in Shelton Washington and other popular communities in our area. Be sure to check out the latest Washington Real Estate Trends. Cities near Shelton are Matlock, Union, McCleary, Allyn, Belfair, Hoodsport, and Olympia.